Physical conditions in Auke Creek and many streams throughout Southeast Alaska are changing. 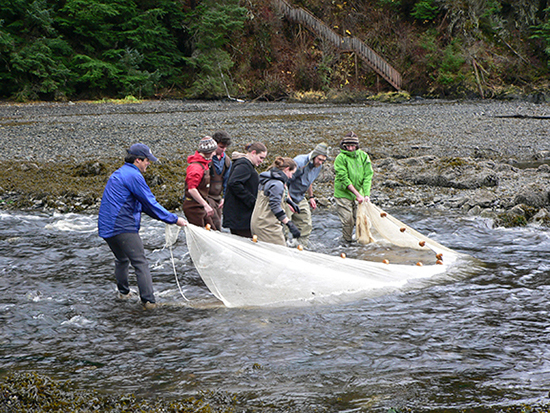 In collaboration with scientists from NOAA, UAS, UAF, and his students, Marine Biology faculty David Tallmon studies how sculpin and salmon in Auke Creek, Alaska, are adjusting and adapting to a changing environment. At the next Evening at Egan, Dr. Tallmon will describe projected future changes of stream conditions in Southeast Alaska. Other important results of these analyses are that most of these runs are occurring over a smaller window of time, and that, collectively, spawning salmon can be counted migrating past the weir about only 55 days a year. In the 1970s, salmon migrated past the weir on the way to spawn over a longer 79 day period. Their availability has decreased for humans and non-humans, who live along Auke Creek’s banks and look forward to an annual salmon harvest. However, there is good news. Despite these shifts in migration timing and the shrinking window over which they can be counted at the weir, Auke Creek salmon have not decreased in abundance. They remain just as abundant as they were decades ago. In other words, they appear to be resilient to the environmental changes that have occurred in the last few decades. But will they remain resilient in the future? All Evening at Egan lectures are simulcast on UATV Cable Channel 11. Live via streaming video.